A 600 kilogram gold dredge could be putting people at risk after being washed from its spot on the Nevis River. 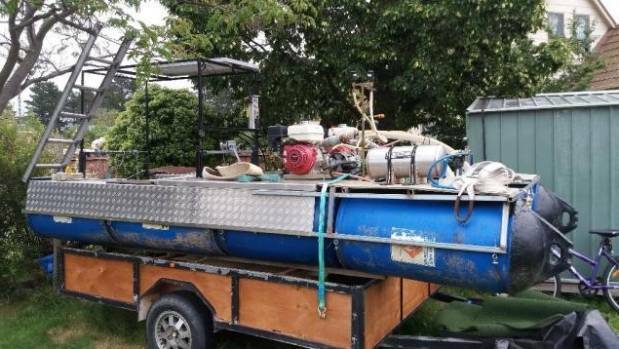 Police urge caution as 600kg gold dredge is washed from its spot on Otago river by heavy rain. insuring them can be a pain most companys don’t want to no about it , I had myn insured once as a moored vessel but I doubted they would honour it if someone nicked it . The idiots tried to talk me into insuring mine. I asked them about how it works, and was told that unless its inside your house your pretty much not insured. So if you lost it in the river, your screwed. If it was stolen out of the bush, screwed. So for the $1000 extra it cost to insure, your better off going thru your home insurance in the even its ever stolen from home… Your not covered if you use it for dredging anyways, so no point in getting insurance on it.